Comedy legend and avid motorcycle fan Ross Noble is embarking on a unique tour this month, asking bike fans and Twitter followers to guide him on a trip to find the best of biking Britain. On the week-long ‘Sit Down Tour’ (May 24-30), Ross will take in England, Scotland and Wales on board Triumph’s 500,000th bike, a uniquely liveried Speed Triple. As well as marking the significant milestone of the half-millionth bike to roll off Triumph’s production line since 1990, the tour is also a celebration of Ross Noble’s 20 years on the stand-up comedy circuit and an opportunity for him to recharge his creative batteries while indulging his passion for motorbikes. The following was tacked on to the end of an article about the 2011 Thunderbird Storm. It nicely described why the America and Speedmaster are still great motorcycles in their own right and not necessarily just “entry-level” bikes, despite what the new marketing regime at Triumph would have you believe. Triumph calls its 860cc Speedmaster and America models “entry-level” motorcycles. These are rorty, 60-horsepower beasts weighing 550 lbs., mind you. I remember when you ascended the performance ladder cubic centimeter by cubic centimeter, and the rungs were indexed exceedingly fine. But these days all that knuckle-dragging before you can walk nonsense is gone, and if you want to get your feet wet without straying from the Triumph cruiser lineup, the new Speedmaster or America are your only options. Neither bike is new, but both have had their bars, seats and pegs repositioned to make them more welcoming to a wider range of riders. The Speedmaster is the more chopperish of the two with a big, 19-inch front wheel and skinny tire. The bars are farther away and it feels clumsier during parking-lot maneuvers, but the floppy feeling goes away a couple miles per hour into the ride. I didn’t measure anything, but the seat height feels pretty low on both these bikes. Suffice to say that if you’re over 5 feet tall, you’ll have no problem reaching the ground. The Speedmaster’s styling is classic bad-boy cruiser. Squint your eyes and a mid-’80s Yamaha XS650 Heritage Special might spring to mind. The Speedmaster is a pretty motorcycle that would not look out of place parked in front of a honky-tonk while you’re inside beating up the patrons. Nor will it break a sweat running with your V-twin-riding buddies on the highway. The America is the Britbike that rocked my world. With its religious adherence to fat-fendered orthodoxy, I figured it would be boring. 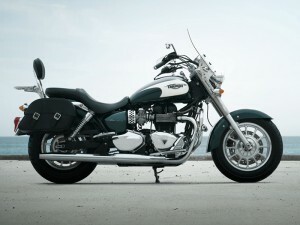 Oddly, the heavy-looking bike steers better than the light-looking Speedmaster. This is a bike that I would not hesitate to ride cross-country or rumble down a graded dirt road. I hate to say this, because it reveals more than I care to reveal, but the America felt like it was custom-built just for me. The controls, as the cliché goes, fell readily to hand. Both twins have plenty of power. They shift wonderfully, rev up quickly and handle confidently. The pegs will drag every time you go around a corner and the rear suspension is painfully stiff, but if you’re lucky enough to begin your riding career on either one of these so-called “entry-level” motorcycles, you may never need another. 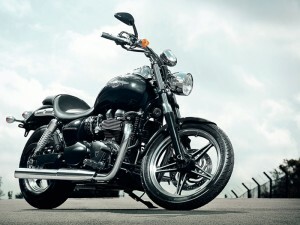 Triumph Motorcycles have released their 2010 sales figures. The press release does not say how many units were sold, but, they had a 1.5% increase in sales over 2009. Meanwhile the automotive/motorcycle industry as a whole suffered a 14% loss in 2010. Triumph Motorcycles have a 16% market share according to the Motor Cycle Industry Association, which is pretty darn impressive considering how many other manufacturers exist. In a recent collaborative exhibition between Triumph Motorcycles and the Birmingham Institute of Art and Design, industrial design students developed a collection of household items created from parts from Triumph Bonnevilles. Although these are not items offered by Triumph, they are pretty cool, and maybe, just maybe someday Triumph (or an authorized branded vendor) will offer real production items like these. 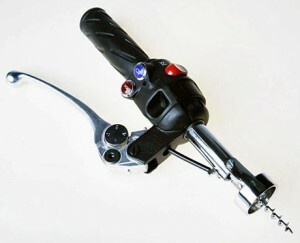 After all, who wouldn’t want a corkscrew made from a throttle grip and brake lever? See more items and comments here in the forum.